Naked trading either in options and futures means NOT hedging the Futures and Options Trades. Naked trading is VERY RISKY and MUST be avoided to save huge losses from trading options or futures. 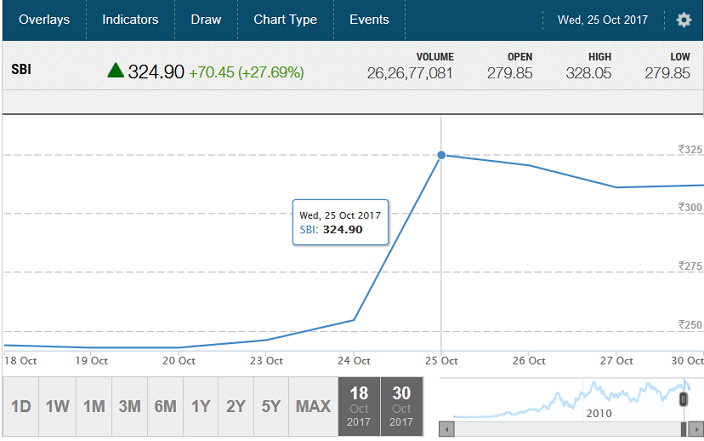 Now imagine loss of a trader who must have Sold Naked Call Option / Naked Future on Oct 24, 2017 or before. 🙁 Therefore selling naked options or buying/selling naked futures must be avoided. One day loss can take away years of profit if you do naked selling of options or do naked future trading. When traders start selling named options? When they start losing money buying options. LOSE – LOSE – LOSE – LOSE – WIN – WIN – LOSE – LOSE – LOSE – LOSE …. But there is a catch – BIG LOSE – sometimes the seller is caught in a storm from where they find it difficult to get out and lose heavily. I don’t usually sell naked options anymore. I used to do it long back, when I used to think I am very smart. A beginners luck may have done it. I did made a decent profit in the first two trades, but then next four were big losses and I have almost stopped selling naked options. Yes I still sell naked options – but on principles and strict stop loss and only when markets give me an opportunity. This is mostly done when the expiry is very near and there is a decent chance for that option to expire worthless. Frankly even then I do not wait till expiry. I close the position early and am happy taking a small profit or loss as the case may be. Waiting to eat the last few nickels and dime of a soon to be worthless option may give a great kick when that actually happens – but I am better off taking the risk. If something goes wrong even in that last few hours – an option that was profitable a few hours ago may become very costly to buy back. Update on 16-Oct-2014: I don’t do this anymore as I feel the risk is not worth the reward. When does one becomes option seller? Unfortunately whether buy or sell, 95% of traders lose money. Ok enough of talking, lets take an example of naked selling. If you think XYZ stock will close above 100 this month you can sell the 100 put options for the current month or even the next month to collect more premium. If the stock actually closes above 100 you keep the premium else you pay for the losses. Can you predict the markets? No one can. So why do people sell naked options? They sell when they are absolutely sure that the option they sell will expire worthless. But it ain’t that easy, if it were everybody would have sold options and be rich!!! Moreover its true that you cannot predict where the markets will go, but you can to some extent predict where the markets will NOT go!!! Sell your naked options there. 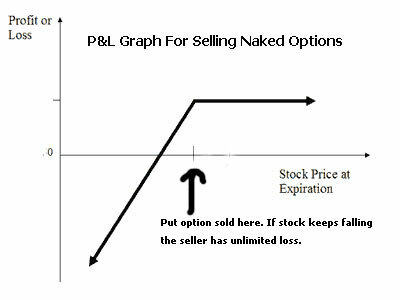 Note: Technically naked put option selling in NOT unlimited loss. Why? Because the stock can fall up to zero. It cannot fall further. 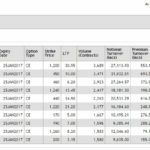 You can easily calculate your maximum loss when selling naked or not-hedged puts. However selling uncovered or naked call options involves real unlimited loss. Because the stock can rise to an unlimited level which you can never figure out. Therefore in the US most retail traders sell put options more than the call option. That does not mean you should start selling uncovered or naked puts because you can still face huge loses. Disclaimer: Naked option selling is very risky. These are some ideas I have developed while actually trading naked options or by doing some research. If you want to sell it naked please keep the following in mind and do virtual trading for at least 3 months before putting your money on the line. 1. When selling naked sell only deep out of the money (OTM) options possibly with options that have deltas =< .1. For example if a stock is around 100 – sell 130 call option or 70 put option, or both. This will give you a good chance of winning. After all what are the chances that the stock will rise or fall by 30% in the same series. Yes you make less profit but the chances of making a profit are more. 2. If in doubt take more time. That is sell the next-month options not the near month as if anything goes wrong – the stock opens gap up or gap down heavily, you will have enough time to give stock come back to a comfortable level to buy back your options at a profit. Highly risky as the stock may not reverse. 3. Or if there is very less time expiry is near and you are getting good premium (this happens when the volatility is very high), you can sell the options to make a quick buck in very less time. Say 2-3% in a few trading sessions. 4. You must have a strategy whenever you are trading options. Whether you are buying or selling. You must have calculated your profit and loss. That is if a position is going against you, what exactly you need to do? Keep a stop loss. When that stop loss is reached you must exit the position. The choice is yours to keep a stop loss or not, but you have to limit your losses. If you are able to limit losses you will survive in your trading business. The problem will be when an underlying opens gap up or down with a huge percentage. If your prediction was right you can buy back your options at a profit, however you can lose a lot when it is against your view. Therefore hedging is important. Buying insurance when needed may be very costly, but at least it will limit your losses from that point. However if the movement continues in the same direction for sometime, the losses will be severely restricted. Unfortunately a whipsaw or market reversal will become costly as the insurance options you bought may start to lose money. It could be that out of frustration you close both your original trade and the insurance trade for a loss. Worst situation to be in. 5. Also you must be having strict stop loss in your system. If your target was to make 100 points you should exit when you are making a loss of 50 or less points. Losses can escalate very fast, so you should be ready to quit if the market goes against you badly. 6. During the life of the options you sold, you should watch them like an owl. Never let go your OTM option in-the-money. Take action quick. 7. Don’t get emotional when the market makes a move against you. Emotion is your biggest enemy. I have done it several times and almost always have lost. If you are emotional, you will keep delaying taking a stop-loss and markets will not work in your favor. You will only suffer more losses. You should make sure you don’t lose too much capital, else just 2 big losses will take you out of the game forever. Hoping that the markets will reverse in your favor is not a good strategy. Important Note: Even though you may think you are smart and can make huge returns with selling naked options, I highly recommend you don’t do it. Think about this – your profits are limited and losses unlimited. If you make profits 10 times, one huge loss can take away all that profits plus some more and you do not want to be in that situation, do you? Let me take an example of myself. In 30-days time once markets tanked 10%. I sold two lots of puts thinking markets usually change trends after a 10% move and my puts will expire worthless. As you can easily guess I got good premium for the puts as the markets were down. Well I was not wrong. However the next day Nifty went down another 2.5%. My stop-loss got violated. Exactly almost from that point Nifty reversed – and that too 10%. 🙁 My puts expired worthless but not before making losses for me. What do you learn from this? That even if you are right in your judgment, sometimes we do not have that patience to wait and watch while accumulating losses. Stop-loss can sometimes be your friend or be your enemy – the problem is you don’t know. Therefore if there is something you don’t know, then its better to hedge that position. In my trading course you will know how to hedge your positions and trade peacefully. Most of the times you win, but when you lose you will see that the great hedge will save you. Had I bought some OTM puts of lower strikes with half of the money I received as premium, I would have had the courage to let it go few points down and eventually made a profit or at least made less loss. Had I left because of the hedge, though small – I would have made a profit. This tells you – no matter what you must not sell naked options. You must always hedge your position. I know a lot of you sell naked options on Nifty and Stocks. What you do when the stock starts moving against the option sold? Do you take a stop-loss? Do you panic and leave everything to the almighty? Praying to Gods for help when the markets are going against your sold option is entirely different topic which cannot be discussed here. What if God comes from heavens and asks why you did not take stop loss when the position was manageable? You know what your answer will be – GREED!!! 🙂 Why should Gods help you if you are greedy – almost all traders are. How can he help everyone? What exactly do you do when your naked shorted options goes in the money? If someone is facing this situation right now write in the comments section. Stop selling naked options. Learn conservative trading and NEVER face huge losses. Excellent Article. Thanks. Keep it up. Yes Dilip Sir u r right.Do not sell naked option without hedging. Now I am doing Conservative Option trading course, so STOPPED Buying/Selling Naked options. Do not forget that Karen the Supertrader has a team to think-tank the strategies and implement. All are highly educated in TA as well as in markets and have lots of software to take a decision. She herself did a USD $22000 Investools PhD course that took 1.5 years. So just by doing the above strategy there is no guarantee that the trader cannot face losses. She in particular can manage the losses very well – which means she knows exactly what to do when the markets are going against her naked options sold. I had read somewhere that she covers the profitable options and sell near the money options to hedge. For example – if markets falling – cover the profitable calls and sell near the money calls that are of high premium. And if markets going up, cover the profitable puts and sell near the money puts. So just be conservative follow the course. For retail traders like us 2-3% a month is good enough and we should be happy with that. Started non-directional trading using options from 2007 with ~$100K capital, and made 50%. Friends put in money to start 2008 off with $700K. Made $41M profits by 2011, fund size was ~$80M. As of May 2012, was managing around ~$160M. Theta trader, tries to pull as much time value out as possible. Theta starts decaying around 45 days. When volatility is high, she keeps on selling and buying back the options to capture the value. Trading index options allow for non-directional play, as well as being able to not be impacted by stocksâ€™ earnings season. Sells the options that expire around 56 days, or 8 weeks away. Usually like to let the options expire when the month comes by. Sells Put options (on a market downswing) that have probability of being in-the-money of ~5% (TOS estimates that by looking at the one-year standard deviation of the underlying and assumes a Normal distribution, so 5% in-the-money is 1.64 standard deviations away). Sells Call options (on a market upswing) that have probability of being in-the-money of ~10%. Tries to sell the Call options above strong market resistance levels. Reason behind the 5% vs. 10% probabilities is that â€œthe market crashes down, not upâ€, then down moves are quicker, so to be safe the Puts need to be further out. The positions are legged-in, i.e. the Puts and Calls are not sold at the same time. Sells more Puts than Calls. Usually commits 50%-70% of net liquidity so as to leave ammo to manage positions. If an option gets to 30% probability of being in-the-money, the position needs to be actively managed. Any costs associated with fixing the problem (e.g. losses due to closing the position), will be made up by selling more options to get the premiums to cover the losses. For example, if the market moves up, she may sell more Call options that are further out (i.e. higher strikes), or sell more Put options at higher strikes (higher compared to the previously sold puts). When the market drops and volatility spikes (i.e. she is losing money on the Puts she sold), the fact that the strikes were far away (5% probability of being ITM) gives her time to assess and adjust her positions. When the Flash Crash of May 2010 happened, she closed her profitable positions and sold options further away (October, November months) to get more time to assess the situation. Watch price and volume, and use bollinger bands. 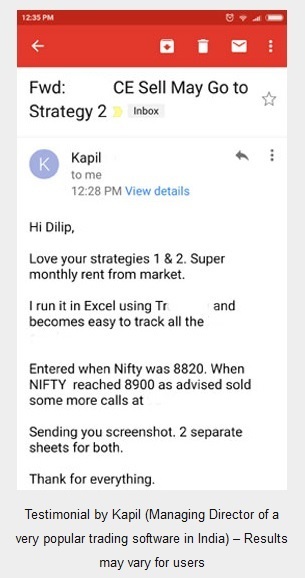 Thank you Dilip Sir for giving some important information about Karen the Supertrader. Excellent and well written article. Gives insight to fathom the Option World. I am a newbie and making losses while picking the threads of this wonderful game. Hope to become profitable after learning a few tricks of the trade. Thanks Vijay. Until you are not confident I suggest trade small. Three things are involved your knowledge, strategy and your own personality. All three have to combine to make profits. That was a great read! Thank you author. Abhihsek am glad that you found it a great read. Hope it helps you in trading. this is the first blog or website that looks refreshingly different from many other free and paid service providers – particularly those who provide tips for a fee. I too spent money on a few such providers and have stopped trading after some losses though not something that i could not absorb. indeed what we do not realise till we loose money paid to tips providers is that the employees also can raise 1 lakh and make 50k every month instead of attempting to convince us to buy their package. i love this concept of 3-4% return and I will be very happy even if it is just 2% like the credit card interest rate! I will also do some more research before deciding to return back. Yes true. I think everyone has at least once sailed in the same boat of paying to tips providers and also losing trading their tips. I too lost 40,000 as fee and 50,000 trading their tips. And I took tips from 5 providers. Fee ranging from 2000 to 5000. The worst part is that when you call them they either do not pick the phone to explain losses or promise you that next time when you pay the money will be recovered. Their next time never comes. On top of that sometime they even scold saying you never traded on time or something of that sort. Sometimes its plain excuse of SMS system not working. No one want to read or research – that,s where the problem is. Everyone is looking for short cut to success which does not exist. I am a strict follower, sorry not strictly some times HOPE & GREED Comes, any way TRY to follow your instruction, recently I have sold 4 lots Nifty Oct 15 ,8100 call @170 & 8050 put @ 103, what will be my Breakeven point , is it Nifty future @ 8250, PLZ help me by your valuable advice.Plz tell this strategy works or not. Your break even total points received which is 273. So on the upper side its 8100 + 273 = 8373 and 8050 – 273 = 7777. Brokerage not counted. So you are safe from 8373 on the upper side to 7777 on the lower side. 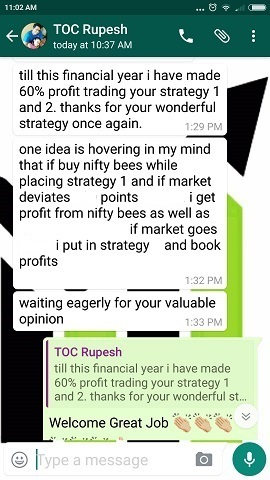 This strategy looks great when initiated, but when Nifty starts to move you will start facing issues. Because all this is good only if Nifty is between 8373 and 7777, during volatile times you may face huge losses – and you will get out to stop losses. Then you will see that Nifty was somewhere in the same band on the expiry day. And of course you will feel bad. 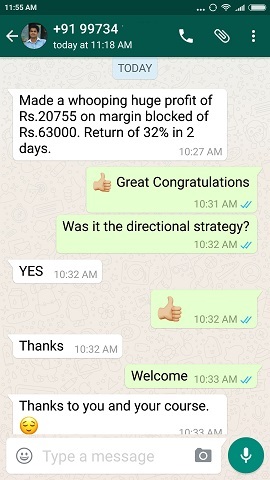 These kind of strategies are very aggressive as one big loss can take away lot of money from you. Have you ever thought what if Nifty opens tomorrow 5% down or 5% up? Please stop trading such strategies. You write well Dilip ji .That shows your clarity of thought and good command on the topics discussed . Like Ur previous posts this 1 also highly educative, informative and eye opening. What i found is Ur replies to some reader’s comments are equally educative and informative if not more than the post itself. 1 of such replies is the 1 given to Mr. Abhishek Patil’s comment on this post. Hat’s of to Ur sincerity and patience in replying to readers comments which most of the bloggers ignore. ‘ Yes I still sell naked Nifty options – but on principles and strict stop loss ‘. ‘ Frankly selling or buying does not matter as long as you are hedging your position. ‘. ‘ Moreover its true that you cannot predict where the markets will go, but you can to some extent predict where the markets will NOT go!!! Sell your naked options there. ‘. 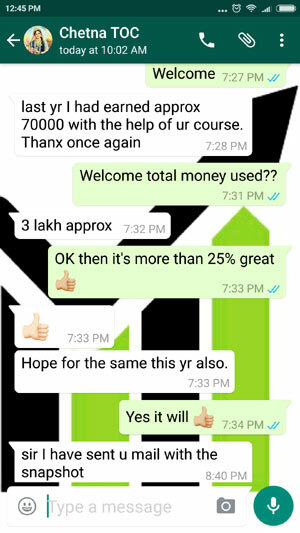 I have been reading your posts regularly and should agree that I have got enough benefit to pay the course fee and I will be doing that very shortly. But one question that lingers in my mind is why don’t the mutual funds adopt your strategy and give 2% return per month? Is there any bar on them not to do so because of the disclosure that they will invest certain percentage in equity/bond/debt instruments? Is trading options not similar to trading in equity? If they adopt this strategy that you have been writing so forcefully, they should be making even better returns than 3-4% returns that you mention. I understand your time constraint and hence you may chose to reply at your convenience or even ignore this. Good question Anuradha. Yes they have restrictions and they can only trade as per the terms set for the fund. For example a hedged fund cannot enter into plain equities. And moreover I think equity funds rarely trade derivatives. So that 2% is not possible. There is a reason they don’t and rules also does not allow them to trade only in derivatives. Reason is pretty simple – in derivatives trading money is not made – it only gets exchanged… from one hand to another… Stock markets and real companies will collapse if only derivatives are traded in stock markets. Thanks for this. I will write a post in future on this. I think you must first learn trading then trade else its all speculations so most people lose money trading. Please first study. how stoploss calculated in sell naked option if sell ashok leyland ce 100 at 2 rs premium at what price stoplloss trigeeres , it will depend on call premium or total money blocked for writing.. This should be under your risk management. So fix an amount which you are comfortable in losing. Once that is reached exit the trade. That is the reason I hedge all my trades which is well defined in my course. Pruthvi Thanks 🙂 I am not the king I am slave of knowledge. And I want everyone to become slave of knowledge, but alas I know that day will never come but I am just trying that through my blog. That’s all. Time Decay (Theta) ……….Important For Earn Money , all strategies are in books and other web materials but real trade is total different so be practical and trade with four eyes….im using time decay method all the time and i sell both call n put with different strikes …….every week i give you one hint ( I dont say it strategy but hint) if you sell call n put with different strike rate its almost hedge each other. if you sell reliance CE 1200@ 20 rs. if you sell reliance PE 1100@ 20 rs. Nilesh this is pure short strangle which works sometimes and does not work sometimes. One bad huge move may take out months of profits. Its is better to hedge it properly and trade. Please do not trade this you may suffer huge loss one day.